​A surprising number of media training participants have asked me why they can't just speak their minds like Donald Trump. They admire his courage to say what he thinks. But while I have some sympathy with the motivation, it does not follow that you should follow Trump's example. Here are six reasons why. 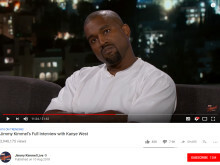 The discussion over Kanye West's pregnant pause, when Jimmy Kimmel asked him about Donald Trump, is missing some important nuances. Worse, any camera-shy Asian business leader who watches West getting cut off will wonder whether they can still take time to think before answering questions, or if they should take part in live TV interviews at all.